There may be times that a backer reports to you that they haven't received their survey invite link via email. Below are troubleshoot steps to help resolve this for the backer. Attempt each troubleshooting step with the backer, one at a time, until the issue is resolved. 1) Check Spam and Confirm the Email address. If a backer is reporting the survey link hasn't been received within 24 hours of launching, first advise the backer to check their Spam/Junk folder for the email. Confirm that the backer is using the email address associated with their pledge. In some cases backers may check the wrong email account for their link. This will allow the backer to request the survey invite email again by simply entering their email address. Your project's Survey Retrieve Link is found in the top right corner of all pages in Manage. Simply click on the blue "View Project Links" link. Then click on copy next to the Survey Retrieve Link and share this link with the backer. 3) Resend the Survey Invite Email. Click on "Resend" from the 'Emails Sent' section of the backer's order. Select "Confirmation Invite" from the drop-down and "Send Email" to resend the survey invite link. 4) Provide the direct survey link. Look up the order using the backers name and help with retrieving their survey link. Once you are in the backer's order, you can give the backer their link directly by clicking the double-page icon next to "Login As Backer". This will copy the backer's specific survey link, paste it in your response to them to give the backer direct access to their pledge. 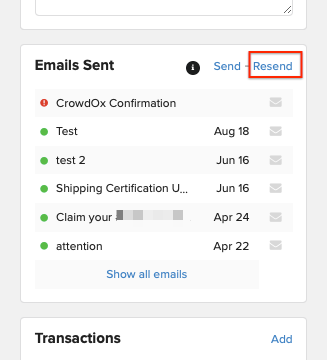 If the backer is using the email address associated with their order but still isn't receiving their invite email, then there is likely an issue with their email server receiving or flagging our emails as spam (this is common for frequent backers). This is often identified by a notification icon next to the backers email address. To resolve this, obtain an alternate email address to use from the backer. Edit the backer's email address and use the alternate email address to receive the communications. Click on the backer's email address to edit. If the backer declines to update the email address, the backer can create an account with our Backer Portal to access their link. Click here for more info. If additional troubleshooting is needed, please have the backer reach out to our support team directly for help (support@crowdox.com).